This is a relatively small but a most densely-populated industrial region with a gigantic capital megapolis, including both Moscow and a considerable part of the Moscow Region. In the 20-th century, the ancient cities of Tula, Ryazan, Yaroslavl, Bryansk., Voronezh, Lipetsk and others have become large industrial centers. Their population substantially increased, whereas the rural population has noticeably dwindled. The northern and northeastern parts of the Region, e.g., the Kirov and Yaroslavl regions have many features in common with the European North. The southern taiga is dominant there with moss and herb spruce forests, including various deciduous species, oak and linden among them. 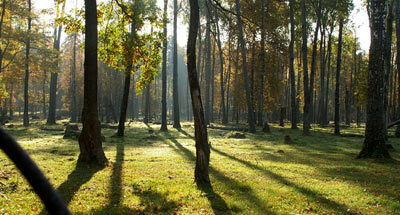 Southward, the taiga is replaced by typical mixed forests, whose massifs alternate with open spaces of croplands. The scenery there is the most typical of Russia — it gives comfort to the eye and makes one's soul peaceful. Those landscapes were glorified by numerous authors and painters. 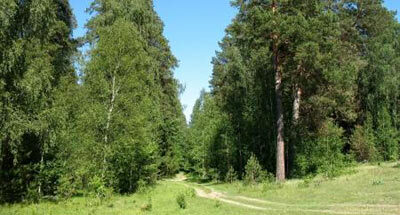 Wheat or oat crops alternate with birch groves and pine forests, but spruce forests also penetrate fairly far south. 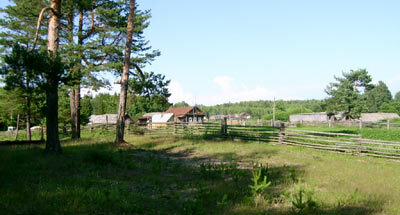 It is not by accident that the National Park "Losiny Ostrov", whose portion is located within Moscow boundaries, is frequently referred to as "the near-Moscow taiga". South of Moscow, in the Smolensk, Kaluga, Tula and Ryazan regions passes a peculiar zone of oak-small-leaved forests which are named the old Russian word "zaseki". Back in the past these forests were cut down (zasekali) to set up a barrier for preventing the inroads of belligerent nomads on Moscow and other cities of Russia. The forest coverage of the southern part of the European center considerably declined in the 19-th century when the forests were cut over extensively for croplands and pastures. However there have remained there such valuable forest massifs as the Usmanskii and Khrenovskii forests, Tellerman oak forests and Shipov forest. Some of them are partly reserved. The Region has numerous rivers, the upper reaches of the Volga River and its tributaries being prominent, including the rivers of Tvertsa, Oka with Klyazma and Moksha, Unzha, Vetluga, Vyatka, Alatyr, Sura, and, partly, Kama. South of the mentioned rivers are the sources and the tributaries of the Don River with such large tributaries as the Khoper and Voronezh and the watershed of the Volga and the Dnieper lies west of this area. 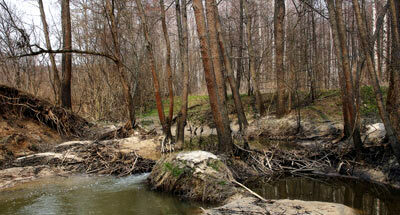 The latter is the main river of the Ukraine, which rises in the dense forests of the northern Smolensk Region. 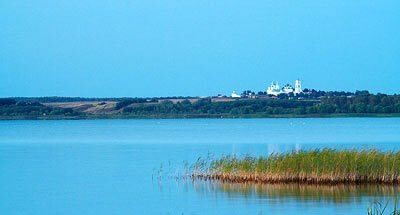 The Severnaya Dvina, which flows over Byelorussia (Belarus) and Latvia rises not far from there. 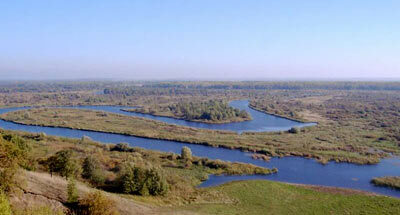 Many rivers of the Ukraine — the Severnyi Donets, Seim, Vorskla and others, also rise in the center of Russia. Hence, the environmental protection and water regulating role of this region is so great. 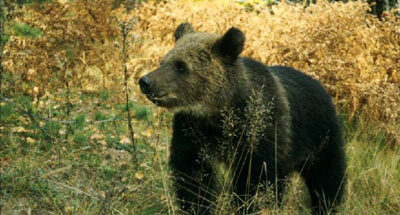 Similar to plant life the wildlife is by far more diverse compared with the European North. Along with the taiga species as the bear, moose, lynx, capercaillie, there dwell there the European subspecies of the deer and roe, the stone marten, and in the west stork breeding grounds are found. Of the rare species, the Russian desman is distinguished, for whose protection several reserves were established. The stock of the river beavers, which were close to extinction in the early 20-th century was recovered. The American mink, musk rut, raccoon dog, axis deer have been acclimatized. The southern part of the region is home to typical steppe species as the bobac, the spotted souslik, and the great jerboa. The human activities have greatly affected the forest-steppe zone of the European center so that the scientists prefer referring to it "forest-field" rather than forest-steppe. The former steppes have been replaced by continuous croplands. The region's nature has been heavily modified. The examples of nature monuments in our history, which are so numerous in the European North are found in the Borodino and Kulikovo fields, the Prokhorovka region near Kursk, where big tank battles were waged. The estate museums associated with the names of Leo Tolstoy (Yasnaya Polyana), Ivan Turgenev (Spasskoe Lutovinovo), the playwright Alexander Ostrovsky (Shchelykovo) and many others are carefully preserved.